A few months ago, I spent time hiking in the woods in Big Sur, mesmerized by the beauty of the Pacific Ocean viewed from the mountain ridges. 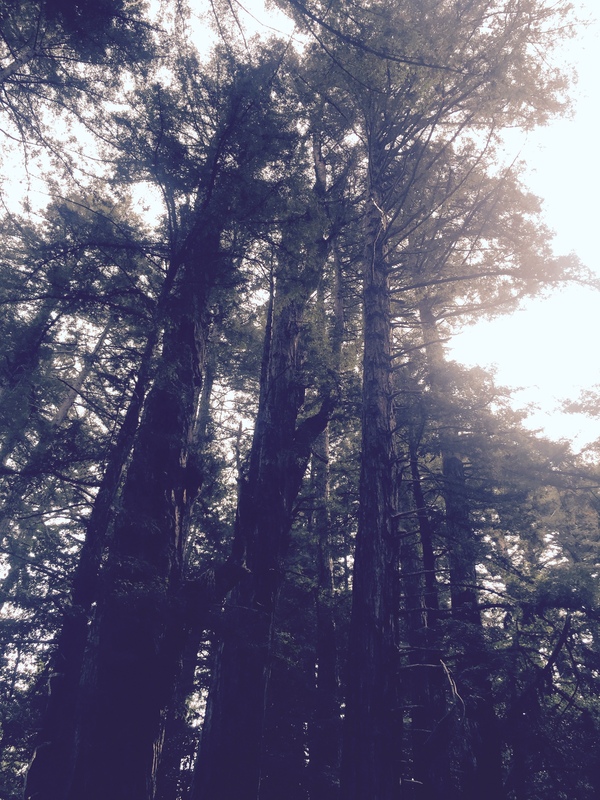 But what actually inspired me and remained in my mind were the Redwood trees. Strangely enough, I couldn’t help but think about pancreatic cancer as I wrapped my hands around the tree trunks and gazed up at their height. I thought their ability to survive could somehow rub off on my fingertips. A local guide gave us a tour of the Redwood trees and described how they endure, sustained by their ecosystem. Their seeds are buried deep in the ground so that they can withstand external threats. And the tree can heal itself, even when there are severe wounds to its branches. Walking among these trees made me feel what’s possible. And it was truly timely, given my inspirational encounter with the Redwoods and their ecosystem, that I recently met Dr. Ron Evans — a far more inspirational encounter — who helped me understand what’s possible for pancreatic cancer. His brilliant breakthrough science focuses on the ecosystem of the tumor and how the barrier around the tumor — Ron calls it an “invisible shield” — prevents the tumor from reducing. Not only is Ron Evans the Salk’s March of Dimes Chair and a Howard Hughes Medical Institute Investigator at the Salk Institute, a Lustgarten Foundation Distinguished Scholar and recipient of two Stand Up To Cancer grants, he is a passionate advocate for fast forceful change in pancreatic science research and new creative treatments. Here is the announcement about Ron’s appointment as a distinguished scholar. I first knew about Ron Evans’ research when my doctors, William Isacoff and Allyson Ocean recommended adding synthetic vitamin D to my protocol last year. I have been taking vitamin D with my chemotherapy for more than a year. When I started, Ron and his colleagues had just published research demonstrating that synthetic vitamin D had been successful in expanding life spans in mice by targeting the stroma, the rim around the tumor cells. Given the research results, a clinical trial was begun immediately at the University of Pennsylvania. 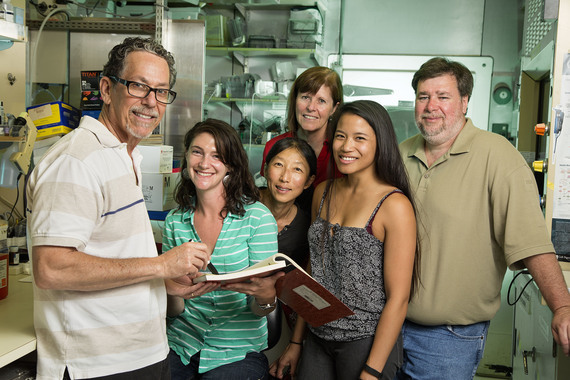 Here is a picture of Ron Evans and his colleagues at the Salk Institute. As discussed in the Salk Institute news release that was issued last year, Ron and his colleagues knew that the ability of the pancreatic tumor to communicate with nearby cells — called the tumor microenvironment — is key to its growth. Tumor cells are sending messages to the stroma that keep the microenvironment inflamed and active; this “living shield” around a tumor blocks the access of immune cells and chemo drugs to the tumor. His team focused their attention on one component of this stroma wall: stellate cells, which usually respond to small injuries by briefly switching to an activated state. But when the stellate cells are near a pancreatic cancer tumor, they get messages from the tumor that constantly keep them turned on, helping the tumor grow and preventing chemotherapy from reaching it. The team found that the difference between activated and inactivated stellate cells was that activated cells had high levels of the vitamin D receptor, and thus the tumor was growing in a local environment of vitamin D deficiency. When the researchers injected synthetic vitamin D to activated stellate cells, the cells returned to their healthy inactive state, weakening the “shield” around the tumor. Here is an additional article on the research. The Lustgarten Foundation has recently announced the funding of a new clinical trial with synthetic vitamin D focused on Stage 4 pancreatic cancer patients. The study is being co-led by Brian Wolpin at Dana Farber Cancer Institute and Eileen O’Reilly at Memorial Sloan Cancer Center. The goal is to establish a bio marker profile for patients whose tumors express the vitamin D receptor. The researchers hope that their results will give oncologists a profile of patients who will respond to synthetic vitamin D treatments. My personal hope is that more pancreatic cancer patients are aware of the potential value of synthetic vitamin D and that their oncologists will soon recognize its possible significance in treatment. When I spoke to Ron recently, he had just been informed that his team had won a new Stand Up to Cancer grant, created with support from the Lustgarten Foundation and Cancer Research UK. Here is more information about the research of the Dream Team. The new research will focus on molecular analysis of a small number of genetic hotspots, which he calls “super enhancers” that can be altered in the eco system. Ron’s enthusiasm for his research is contagious. As a pancreatic cancer patient, I think his efforts on the tumor micro environment are ushering in an entirely new way for treatments to develop that will extend our life spans and create a better quality of life.